Admittedly becoming a mom for the first time is really exciting stuff. Family members and friends get crazy and start buying pink ruffled and bow tied onesies in anticipation of the wee one. The Grandmas, oh, bless those grandmas, who begin to knit and crochet and hit every craft table between your home and Ohio for all things baby. And the thought that keeps crossing your mind is, “Where were all these pregnant women before?”. Yes, you’ve got baby on the brain and a baby on the way. You’ll be inundated with baby showers and silly games and three of everything because you just don’t know what to register for. I’ve a couple kiddos of my own and have been around the block as a Birth Doula for over 15 years. In this time I’ve noticed there are about 5 things you don’t need as a new mom and a few things you do. Of course, this is all relative to whether you’re having multiples, have previous children, what kind of space you have in your home and how much you want to spend (and receive). #1 You might be surprised when I say you won’t need a crib-at least not yet. They are expensive (except for the cute ones at Ikea or a hand-me-down), they sit empty for quite some time and it feels like you’re putting your baby in a big cold storage area when they are just oh, so teeny. If your’e a co-sleeping family your baby will be in bed with you. If you’re not a co-sleeping family, many families keep the baby at their bed side in a co-sleeper, bassinet or pack-n-play for many months. This makes it easier on mama to get up and nurse throughout the night without having to entirely wake up, put on a robe, cross the cold floors, pick up the baby, go to the rocker, nurse baby, and repeat. With the bassinet at your bedside, you sit up and pull baby to you for nursing and place back in bassinet, all without having to get out of bed. #2 For the love of God, highchairs are like its own restaurant booth with their behemoth size. They are plastic, cumbersome and really difficult to clean with all its cushion crevices and plasticness. It will be a whole half-year, folks, before your baby is remotely ready to eat solids, so no need to take up room in your basement, storage area or kitchen until then. What we found, and I loved, was a little seat like this. It’s a quarter of the price, super easy to clean, folds up (ours did, not sure about this one) and could be conveniently brought along to Nana’s or wherever we were headed. I’m not a fan of plastic, I will admit, though it is sturdy and we were able to pass it on to friends when we were done with it. By the time the girls were two, we used one of their play silks as a chair tie when it was time for a meal or snack and, instead of strapping them into the booster with the tray, we would sit them on the booster and tie the silk around their waist to back of chair as a gentle reminder to stay in our seats as we ate and for safety against falling. #3 Extra laundry in the form of baby jeans, hoodies and other ridiculously unnecessary (though cute) clothing. You will need 172 onesies (or so it seems) and a dozen sleepers. Other than that your first couple months are spent mostly holding your baby, so outside of a onesie and the blanket they are swaddled in (depending upon where you are and the weather of course), an extra layer of a sleeper is all that’s necessary. The laundry and the nearly impossible folding of items like baby jeans is more than you need. 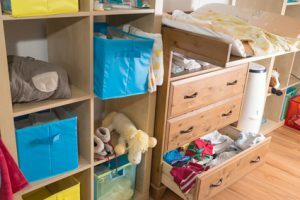 Considering your baby will poop in a yellow color, spit up and leak through their diaper when they wet, you’ll already have enough laundry to do…keep a few cute baskets under the changing table: one for onesies, one for sleepers and one for one piece outfits and don’t even fold them. #4 Strollers are a super individual choice and I don’t advise purchasing one until your baby is a few months old and you’ve figured out what you need and why. They are expensive so I see the value in putting them on your registry and letting others purchase or chip in for you. Buying a stroller or three before baby comes is tricky and here’s why. Do you buy the jogger? Not unless you were already an active jogger/brisk walker/runner prior to pregnancy or plan on taking it up post pregnancy. Those cadillacs are not cheap. My father-in-law purchased one for us and that thing had over 1,000 miles on it after two kids alone. Do you buy the umbrella stroller? Not unless you spend a fair amount of time in airports or the mall. They are flimsy, small and cheap. What about the infant seat/click in stroller? That was a big mistake for us and a waste of money. It doesn’t work for much more than a neighborhood stroll, it’s cumbersome and I’d rather wear my baby while out walking or to/from appointments. Just take your baby out of the infant seat in the car and tuck them into your wrap, and off you go. #5 This one’s a little different because it’s not a “thing’, AND, it’s something you don’t need as a new mom. Stress. stay in bed for a week with your baby getting to know his/her cues for feeding, bonding, diapering, etc. communicate your needs daily (or hourly at first) to your partner. No joke here-the needs of a new mama are multi-faceted, much like that of the wee one you’re now in charge of. Lean in to the support of your partner for your success as a mama. This isn’t a one woman show.